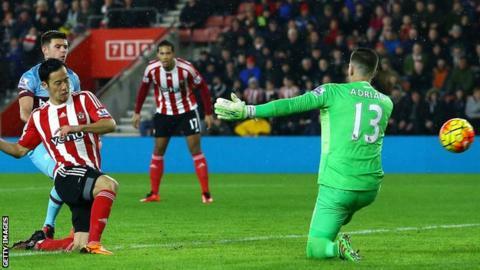 Southampton earned their fourth win in five matches, despite a third red card of the season for midfielder Victor Wanyama. Saints started strongly and took the lead when Maya Yoshida smashed home Sadio Mane's centre. Wanyama received a straight red from referee Mark Clattenburg for diving in on West Ham midfielder Dimitri Payet. The hosts survived a late scare when defender Cedric sliced a clearance narrowly past his own post. Striker Emmanuel Emenike - a January arrival on loan from Fenerbahce - made his debut for the Hammers, but he missed the opportunity to earn a point for his side when he headed wide from Enner Valencia's cross. The victory lifts Southampton to seventh in the Premier League table, just one place and two points behind their opponents. West Ham will be disappointed not to take anything from the game after playing the last 37 minutes with an extra man. Wanyama - in his third season at St Mary's - is one of Southampton's senior players and can be a highly effective operator at the base of midfield, but his appetite for a tackle can also be his undoing. Having already been dismissed against Bournemouth and Norwich this season, Wanyama became the first player since Wes Brown in 2013-14 to receive three red cards in the same season. In truth, it was perhaps a case of the player's reputation preceding him, as Wanyama's challenge didn't appear to make significant contact with Payet, but Mark Clattenburg - whose tally of five red cards this season is the second-highest among referees - decided that the tackle was worthy of a straight red. That Southampton were able to see out the remainder of the match with 10 men owed much to another excellent performance from their back four, plus goalkeeper Fraser Forster. Since Forster returned from patellar tendon surgery last month, the team has recorded five clean sheets in a row - roughly seven and a half hours of football without conceding. It wasn't one of Forster's busier evenings - though he did show his class with a brilliant reflex stop from a Winston Reid header - as centre-backs Virgil van Dijk and Jose Fonte dominated Hammers strikers Enner Valencia and substitutes Emenike and Andy Carroll. For West Ham, this was a missed opportunity to overhaul Manchester United in fifth place - and the Hammers will rue their profligacy in front of goal. Slaven Bilic's side had 18 shots - but only found the target with two. Enner Valencia had been in excellent form, with four goals in his previous four games, but here the Ecuadorian striker was uncharacteristically wayward, shanking an effort wide from the edge of the area when well placed. Southampton manager Ronald Koeman: "I'm very pleased with the final result. It was a difficult game from the start, more difficult after the red card to Victor Wanyama. "But even with one less on the pitch we had the best chances to score a second. We showed very good defensive composure, good defending. I don't remember one big chance [for West Ham]." On Wanyama's sending off: "You can't do that tackle. It's a hard tackle. You give the referee the possibility to give the red card." West Ham manager Slaven Bilic: "First I would like to congratulate Southampton. They were very good at defending in the box. They deserve this. "We did not create enough. Our crosses were quite poor, they defended really well. When you lose a game like this, we are gutted. "For me it was a red card. When that second leg comes... it was a reckless challenge." Two of Maya Yoshida's three Premier League goals have been against West Ham United. Victor Wanyama is the seventh player to be sent off three times in the same Premier League season, joining Vinnie Jones, David Batty, Slaven Bilic, Craig Short, Frank Queudrue and Wes Brown. There has been a Premier League high of 10 red cards in West Ham games this season (four for them, six for the opposition). Fraser Forster's clean-sheet percentage is the best of any goalkeeper with 30 or more Premier League appearances, with 18 clean sheets from his 35 games (51.4%). Southampton visit Swansea next Saturday, while West Ham travel to Norwich. Match ends, Southampton 1, West Ham United 0. Second Half ends, Southampton 1, West Ham United 0. Attempt blocked. James Collins (West Ham United) left footed shot from the centre of the box is blocked. Corner, West Ham United. Conceded by Cédric Soares. Attempt missed. Enner Valencia (West Ham United) right footed shot from outside the box is too high from a direct free kick. Emmanuel Emenike (West Ham United) wins a free kick in the attacking half. Attempt missed. Charlie Austin (Southampton) right footed shot from the centre of the box is close, but misses to the right. Assisted by Oriol Romeu. Sam Byram (West Ham United) is shown the yellow card for a bad foul. Offside, West Ham United. Dimitri Payet tries a through ball, but Sam Byram is caught offside. Attempt missed. Enner Valencia (West Ham United) right footed shot from the right side of the box is high and wide to the right. Assisted by Dimitri Payet. Jordy Clasie (Southampton) is shown the yellow card. Attempt blocked. Andy Carroll (West Ham United) left footed shot from the centre of the box is blocked. Assisted by Alexandre Song with a headed pass. Attempt missed. Alexandre Song (West Ham United) right footed shot from outside the box is too high. Assisted by Emmanuel Emenike. Corner, Southampton. Conceded by James Collins. Attempt blocked. Charlie Austin (Southampton) right footed shot from the left side of the box is blocked. Assisted by Oriol Romeu. Attempt blocked. Enner Valencia (West Ham United) left footed shot from the centre of the box is blocked. Assisted by Sam Byram. Attempt missed. Emmanuel Emenike (West Ham United) header from the centre of the box misses to the right. Assisted by Enner Valencia with a cross. Substitution, West Ham United. Emmanuel Emenike replaces Michail Antonio. Substitution, Southampton. Charlie Austin replaces Graziano Pellè. Attempt missed. Alexandre Song (West Ham United) right footed shot from the left side of the box misses to the right. Assisted by Dimitri Payet. Attempt blocked. Mark Noble (West Ham United) right footed shot from outside the box is blocked. Assisted by Enner Valencia. Enner Valencia (West Ham United) is shown the yellow card for a bad foul. Graziano Pellè (Southampton) wins a free kick on the right wing. Attempt missed. Shane Long (Southampton) left footed shot from the centre of the box is too high.